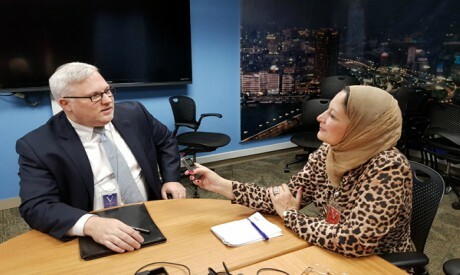 Joel Rayburn, US deputy assistant secretary of state for the Levant and special envoy for Syria, explains in an interview with Al-Ahram Weekly the American strategy towards Syria, emphasising that the presence of the US military in Syria is based on completing the enduring defeat of the Islamic State (IS) group. Rayburn, appointed last July and previously senior director for Iran, Iraq, Syria and Lebanon at the US National Security Council, is a retired US army officer. He described the Russian accusation that the US is “moving terrorists from Syria to Iraq and Afghanistan” and wants to set up an independent Kurdistan “as absolutely absurd” and based on Cold War suspicions. Of the summit that was held on 27 October between Russia, France, Turkey and Germany, he said that the US sees the UN-based Geneva Process as the proper political path to finding a solution to the Syrian crisis and that any arrangements made about the future of Syria must be done under the auspices of UN Security Council Resolution 2254. He said he hoped a constitutional committee could be convened in Geneva in November to draft a new constitution for Syria. What is the aim of your current visit to Egypt? This is my first visit to Egypt since being appointed in July as the US envoy to Syria. The aim to come here is because the US team working on Syria has been working very closely with its Egyptian counterpart, and it is very important that the US and Egypt work jointly for a solution in Syria. We believe, with Egypt as well as our partners in the Gulf region, that there is a need to find a political solution in Syria and that it is very important for the rest of the Arab world to be involved in helping to ease the suffering of the Syrian people and getting to a peaceful end to the crisis. Egypt and the United States are both members of the group for Syria that includes the US, Egypt, Britain, France, Germany, Saudi Arabia and Jordan. We have been working very closely together to reinvigorate the political process to find a solution to the Syrian crisis. So that’s why I am here: I am meeting my counterparts from among the Egyptian officials and from the Arab League to find ways to work together to give a push and momentum to the political process. What is the American strategy on Syria? It’s very clear to us, and we have very clear guidance from the president and the secretary of state and other US leaders that the United States strategy is to work towards three mutually reinforcing objectives in Syria that include the defeat of the Islamic State group, in other words completing the campaign to eject it from Syrian territory and then act in such a way that makes sure it cannot return to territories that have been liberated by the coalition and its partners. The US has also made it very clear that we see it as necessary to bring about the withdrawal of all Iranian-commanded forces from all Syrian territory because the role that they have played in Syria and elsewhere has been so destabilising and has cost so much in terms of violence and conflict. In order for us to see a stable outcome to the Syrian situation the Iranian-commanded forces have to leave. The third element is that we need to see a political settlement of the conflict under the auspices of UN Security Council Resolution 2254 and the political process supported by the UN in Geneva. These are the main elements of our Syria strategy, though there are other elements that are important as well, such as the importance of preventing the spread of chemical weapons and weapons of mass destruction in the region. Is there a timetable for the withdrawal of American troops from Syria? No, it’s condition-based: the presence of US military forces in Syria is part of the campaign against the Islamic State, and the condition for the US forces to leave is completing the enduring defeat of this group, so the US forces will stay in Syria until that happens. Only the defeat of Islamic State? Only the defeat of Islamic State. The US approach more generally also focuses on getting Iranian-commanded forces out of Syria and finding a political solution, but the operational military mission is focused on defeating Islamic State. Will the US have a role to play in reconstructing Syria, especially after US President Donald Trump cut $230 million in assistance? The US position is that there will be no US assistance for reconstruction and the US will not support other assistance from elsewhere for reconstruction until there is irreversible progress in the political process to solve the conflict under UN Security Council Resolution 2254. That’s different from stabilisation funding, however, and the review that the president instructed us to do of our stabilisation funding – funding being used to stabilise territories liberated from the Islamic State or needing to be reinforced against the Islamic State – was to ensure that there were contributions from the rest of the region and the international community to carry out that task. The US has a substantial military role as part of the International Coalition in Iraq and Syria, and so our leadership wanted to see full contributions in terms of resources from other partners and allies, and we are beginning to see that. We have projects from our partners and allies that actually exceed the amount of stabilisation funding that the US had original forecast would be needed. Stabilisation is different from reconstruction, since we are talking here about the removal of mines placed by Islamic State. For example, Raqqa is one of the most heavily mined areas we have seen, and the mines have been placed there to prevent the city from coming back to life. Stabilisation also means removing rubble from the streets so that people can move and trying to restore basic services like electricity and sewage. That’s different from reconstruction. The Russian foreign minister has accused the US of moving some terrorists from Syria to Iraq and Afghanistan to create a “new Kurdistan”. How do you reply to such accusations? Both these accusations are false. The first one is absolutely absurd, and the United States has done no such thing. The US is conducting a campaign against the terrorists in Syria, Iraq and Afghanistan. It is absolutely preposterous to make this kind of claim. We are seeing a lot of disinformation owing to the Soviet model and the Cold War model to produce such disinformation in a constant drip-drip of propaganda. On the Kurdish issue, I would just say that the US position is that we support the idea of one Syria and we support the territorial integrity of Syria. We are not trying to create separate states inside Syria. We believe all Syrians should have their civil and human rights guaranteed, but that does not mean that we support the separatism of any group inside Syria. The Jamal Khashoggi affair has led to the US again cooperating with Turkey. Could it impact positively on cooperation on Syria? Let me say that the Khashoggi issue is not in my portfolio, but clearly Turkey is an important partner with the US and an important ally, so we absolutely want to work together towards our shared interests in Syria. The three aims that I mentioned for the US in Syria we think Turkey shares in seeing the defeat of Islamic State, getting all Iranian forces out of Syria, and finding a political solution to the conflict. When we talk to our Turkish counterparts, they agree with us that this is the right set of goals for Syria, so there is a basis of shared goals to work together and also to de-escalate the conflict and to reduce the level of the conflict. We can work together with Turkey in key places. That’s why we are working so hard right now to create a mechanism to stabilise the territory around Manbij in northern Syria, and we actually have a joint military effort right now to train patrols that are actually patrolling the line of demarcation around Manbij together in order to make sure that that line can’t be crossed by terrorists and to keep the situation calm. That’s something that has been very productive. Both sides have very strong interests in working together along those lines. How do you view the summit that was held on 27 October in Istanbul between Russia, Turkey, France and Germany? The US was not involved in that summit. Our position is that the proper political process in Syria is the Geneva Process, so we support the UN political process and hold that any arrangements made about the political future of Syria must be done under the auspices of UN Security Council Resolution 2254 and the UN road map. Turkey wants to keep an area of 40 km inside Syria under its control. How does the US view this goal? First of all, Turkey is our NATO ally, and we want to see Turkish legitimate security concerns met. In the long run, the US wants to see all foreign forces out of Syria, including the American forces, so we don’t support the military occupation of any territory in Syria. The United States is not there on that basis: we are there to carry out a specific military mission. The end goal in Syria, if we get to a political settlement, if the Iranian forces are gone, if there is the enduring defeat of the Islamic State, is to see all the foreign forces leave, and there should be a return to the amount of foreign involvement in Syria that there was before 2011. Iran was able to exercise deep influence in Iraq after the US-led invasion of Iraq. Has the US learned its lesson, and will it be able to avoid making the same mistakes in Syria? I don’t agree that the Iranians control Iraq. There is a lot of resentment inside Iraq at the Iranian involvement, including at the militias that the Iranian regime supports inside Iraq, so many Iraqis are really tired of the high-handed attitudes of some of these groups, many of which the US considers to be terrorist groups. I think the bigger picture is that the Iranian regime has increasingly over the past few years caused destabilisation across the Arab world. We have seen military intervention by the Iranian regime in various countries to an unprecedented level, and the Iranians are fuelling civil wars and conflicts, including by trying to polarise local populations along sectarian lines in many countries. This appear to be their strategy to destabilise these countries and to take advantage of the internal conflicts that they help to create in the Arab world to further create military intervention points that they can use to threaten other countries in the region. We have seen this pattern repeating itself in Yemen and Lebanon and now in Syria. This is why ensuring that the Iranian forces and militias leave all of Syria is so important to US strategy. It will not be easy, but it is not impossible, and it is necessary. Some people think that the American insistence on getting the Iranians out is only in order to protect Israel. It is not only to protect Israel. Obviously, the Iranian regime is trying to set up a military capability inside Syria to threaten Israel, but that same military capability is a threat to Jordan, Lebanon and Turkey, and it could be a threat to Iraq, Egypt and the Gulf countries. I don’t think Iranian ambitions extend only to Israel. My own view is that they have ambitions to control the whole region. Did the US speak to the Russians concerning the decision to provide Syria with new S-300 air-defence missiles? The US position, and that is the message that we gave to our partners and to other parties involved, is that the introduction of this kind of weapons system into Syria will be a dangerous step. It has the potential to create more conflict, and this is the time that we need to be working together to try to deescalate the conflict. So, we viewed it and still view it as something that could escalate the conflict and make the situation worse. We definitely advise all the parties involved that it’s a step that shouldn’t be taken. But it has been taken already? We will see how it turns out on the ground. Just because a step has been taken doesn’t mean it can’t be taken back. The Russian president said lately that his country had fulfilled its goals in Syria and that Syrian President Bashar Al-Assad’s troops now control 90 per cent of the country. Is this true? No, the Syrian regime forces are relatively weak, and to be honest with you they control maybe half of Syria’s territory, maybe a little over half, and they control less than half of the population. The control they have comes from the presence of the Russian military and the Iranian-commanded forces. Even with this military support, the Al-Assad regime still controls only around half of the country’s territory. This means that there can be no military solution to the conflict. There has to be a political solution to the conflict. That’s why the US supports the de-escalation of the conflict, a freeze in the fighting in places like Idlib, and moving the issue to the political track. Stop the issue on the military track and move it to the political track – this is the only way. There was supposed to be a new constitution and elections in Syria, but this process has been late. Are you optimistic that these things could take place in the coming months? I am optimistic about the political track, and the reason is that the whole world can see that a military solution is not in reach. That’s why a small group of foreign ministers, including the Egyptian foreign minister, met in New York on 27 September to push for a political solution, and we are optimistic as a group that there is a window of opportunity because the fighting has stalled in most of Syria, and yet the country is still divided and the political causes of the war have not been solved. This means there is a window to move to a political process. We are flexible on the time line: the point is right now to get the political process restarted and moving. Once you have that established, then people will turn away from the battlefield and try to solve their issues and I think move to the political process. What is Egypt’s role in this political process? First of all, the Syrian problem is a problem that affects the whole region. If the fighting won’t stop, it will continue to burn, and there is no reason why it won’t spread and become a danger to the rest of the region. That’s why Syria’s neighbours have a vital task in trying to help the Syrians solve the conflict, so absolutely Egypt has a role to play. There is a problem from the Iranian regime’s military, there is the problem of the refugees, and there is the problem of terrorism, in addition to the danger of conflict between states in the region. These are all dangerous for countries that surround Syria, including Egypt. They are things that we have to solve together. Do you think the resignation of UN envoy Staffan de Mistura is a sign of anything? His main reasons were personal reasons. I have known him for a long time, and I have a great deal of confidence and trust in him. I have seen him work in Iraq, Afghanistan and Syria. He has been doing his work in Syria for almost four and a half years. We need to focus our attention on the window of opportunity he himself helped to create. We are in a position now where we really have a chance to create a constitutional committee in the very near future in Geneva that can begin to work through the elements of the constitution that need to be redrafted or revised to change the arrangements of the government in Syria. Can the Idlib agreement between Russia and Turkey help decrease the impact of terrorist groups in Syria? Let me say something at the beginning: there are a small number of terrorists inside Idlib. From the US perspective and from those of others in the region, Hizbullah is a terrorist organisation, and there are other terrorist organisations as well. So Idlib is not the only place where there is a terrorist problem, including in the north-east of Syria where we have the problem of the Islamic State that we are trying to solve. We think the agreement that Russia and Turkey made in Sochi on 17 September on Idlib regarding a ceasefire was a positive step. We were cautiously optimistic about it, and we are now more than a month on and it looks as if the agreement is holding. The level of violence has really decreased along that line, and it is a window of opportunity to turn to the political process. We are still concerned that there are groups that will try to undo the ceasefire agreement in Idlib and that includes Al-Assad regime troops. We don’t trust them or the Iranian regime, both of which may try to spoil the agreement. We hope steps can be taken to ensure that this ceasefire is permanent. Is this distrust the reason why the US has not pulled out allied Kurdish troops from Idlib, as Turkey has alleged? I don’t know what Kurdish troops there are in Idlib. That is not something that we have thought about, and it is certainly not what we are trying to do. We 100 per cent support the idea of a ceasefire around Idlib. Is there a timetable to start a political track? We believe the constitutional committee should be convened in Geneva in November, and we think it should be done as quickly as possible. We had hopes that it could be done even sooner. We see no reason why the constitutional committee can’t convene in the very near future. It is time to go ahead and to invite delegates to Geneva and begin the constitutional work. How do you view the US-Egypt relationship at this stage? The broader relationship is beyond my portfolio, but what I can say is that on the issue of Syria I find that our relationship is very strong, that we share goals together, and that it has been very useful to the US to be able to consult with our Egyptian counterparts because they are very skilled diplomats and their advice has been very useful for us. Being able to get the small group together on a joint programme and to push for a political process [has also been very useful]. We also have a very strong relationship with our counterparts at the Egyptian Embassy in Washington.